What can I do with this diploma? How many internships are there? How long are they? Where can I work during my stage? What do I need to be admitted? Do I have to be from a farm? How do I book a room in residence? Is this an undergraduate program? Can I study part-time or as part of a continuing education program? What are the advantages of being part of McGill University? This is a three-year program. It includes six teaching semesters and two summer internships. Students graduate with a Quebec Diploma of Collegial Studies, part of the Quebec CEGEP system. Graduates who go on to own part of an agricultural business within Quebec are eligible to apply for a $50 000 establishment grant. Most of our graduates are from farms, and they return home after graduation to take over the family business. They can access grants and loans to make improvements to their farms such as increasing herd size, renovations, modernizations and new machinery. Others start their own agri-businesses. Our graduates also find work throughout the agricultural sector in feed sales, seed and fertilizer sales, genetics, as farm managers, horticulturists, and much, much more. Some of our graduates begin undergraduate degree programs in agriculture. Altogether, there are four internships, or stages. The first one is in October of the first year and lasts one week. The second is in February/March of the first year, and also lasts one week. The third and fourth stages are during the summer (between first and second year, and between second and third year) and each lasts 13 weeks. The FMT program has connections to many different farms and businesses, both local and in Western Canada. It is the responsibility of the student to pick his/her desired stage location and make the arrangements. Students who come from a farm at home are not permitted to work at home for the first summer stage, but are encouraged to work at home for the second summer stage. The two one-week internships might be paid, and might not, depending on what training is involved in the work you will be doing. The first summer stage is usually paid. If you work at home for the second summer stage, then payment depends on you and your parents! 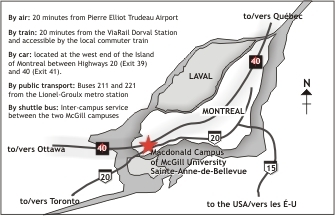 The Macdonald Campus is located in Ste-Anne-de-Bellevue, on the western tip of the island of Montreal. We're two hours from Ottawa, two hours from Sherbrooke, and 30 minutes from downtown Montreal. The official deadline is March 1st. Quebec students can apply through SRAM (deadline March 1). They can also apply through the McGill online application, which also has an application deadline of March 1st. Keep in mind that after you apply, we must receive all of your supporting documents before we can reach a decision on your application. We strongly recommend all students apply well before March 1st. All applications received up to this date will be considered equally for places. In order to have enough time to obtain the necessary travel documents, International students must apply before January 15. Students should have a good practical knowledge of farming under eastern Canadian conditions. One year of experience is recommended, but under special conditions a four-month summer season is acceptable. Students coming from Quebec need their high school diploma (commonly referred to as the DES - diplôme d'études secondaires) with a minimum of Secondary V English and French, and Secondary IV History, Science, and Math. Additional math or sciences can also be useful. Grade 11 and 12 French are strongly recommended. For other Canadian students, the minimum French requirement is grade 10 second language. Please contact the department for more information about equivalent math and science courses. No. We have students every year who come from suburbs, large cities or simply non-agricultural rural areas, who go on to establish their own farm, to manage an existing farm or to any number of positions in the agri-business industry. There are opportunities to gain agricultural experience right here on campus. That said, students are still required to have some agricultural experience to be competitive in their application. Macdonald Campus has residences on campus, and Ste-Anne-de-Bellevue has many affordable apartments and houses for rent within walking distance. To view some apartments and houses available, visit McGill's Off-campus Housing website and, using the map, select "MAC-around Macdonald Campus" to see what is available. If you are interested in living on-campus, you should indicate this where it asks on the application form. Once you have been admitted, and you have confirmed the offer of admission, a residence application form will open for you in Minerva (McGill's online registration system). You must complete all the steps and pay your residence deposit before June 1 to be eligible. Student services and student society fees total approximately $1730 per year for all Canadian first-year students. If you are from Quebec, this is all you pay. International students also pay a mandatory health and dental insurance which is added to the student services total. International and Canadian students who are not residents of Quebec will also be assessed a tuition fee of $1219 per semester starting with year one students in Fall 2015. We recommend budgeting an additional $300 for books and supplies. Living expenses depend on where you live. No, the Farm Management and Technology program is not an undergraduate (Bachelor's degree) program, it is a collegial diploma program that is part of the CEGEP system in Quebec. It does not lead to a degree, and students should not apply to the program as a means to get into undergraduate programs at McGill. FMT is the only collegial program offered by McGill University. No. The FMT program is designed for full-time students only - courses are only offered once per semester, and in one time slot. Because of the sequential nature of the program it is not possible to study part-time, or to complete the program in less than 3 years. It is also not possible to take individual courses from the FMT program for continuing education purposes. Inquiries about continuing education opportunities in agriculture should be made to the Faculty of Agricultural and Environmental Sciences. As a McGill Student, you have access to all McGill services, including athletic facilities, libraries and Student Services at Macdonald Campus offers Career Planning Service (CaPS), counselling, Student Financial Aid, Student Health Services, distributes Blue Cross International Health Insurance cards to international students and coordinates all the midterm examinations for students registered with the Office for Students with Disabilities. Other services available include dental and health insurance plans (through MCSS). The campuses are connected by a shuttle bus, which is free for students.